Sponsors of study advocate use of solid carbon block filters to limit exposure to breast cancer chemicals. Among the preventative measures advised include limiting exposure to gasoline fumes and vehicle exhaust, avoiding flame-retardant and stain-resistant furniture, and using a solid carbon block filter to treat drinking water. A new study published in the peer-reviewed journal, Environmental Health Perspectives, identifies key chemicals in the formation of breast cancer tumors. Sponsors of the study advocate methods to limit exposure – including the use of solid carbon block filters for drinking water. The study, New Exposure Biomarkers as Tools For Breast Cancer Epidemiology, Biomonitoring, and Prevention: A Systematic Approach Based on Animal Evidence, was jointly-conducted by scientists from the Silent Spring Institute and the Harvard School of Public Health. They identify 17 groups of commonly encountered carcinogenic chemicals linked to breast cancer, including benzene and butadiene (found in vehicle exhaust, tobacco smoke, or charred food), methylene chloride (found in cleaning solvents), flame retardants (found in treated furniture or rugs), stain-resistant textiles (found in furniture upholstery), and disinfection byproducts (found in drinking water). Among the preventative measures advised include limiting exposure to gasoline fumes and vehicle exhaust, avoiding flame-retardant and stain-resistant furniture, and using a solid carbon block filter to treat drinking water. Silent Spring Institute is an organization dedicated to identifying and breaking the links between environmental chemicals and breast cancer. The Harvard School of Public Health is an institute dedicated to the advancement of public health through research and education. Environmental Health Perspectives is a peer-reviewed research journal focused on the interrelationships between the environment and human health, published with support from the National Institute of Environmental Health Sciences, a division of the U.S. Department of Health and Human Services. 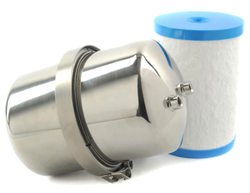 Founded in 1970, Multipure is an industry leader in the manufacture and distribution of drinking water systems and compressed solid carbon block filters. Headquartered in Las Vegas, Nevada, Multipure employs over 200 people, and is committed to being a company that provides the people of the world with the best quality drinking water at an affordable price. Multipure is a member of the Water Quality Association, the Las Vegas Chamber of Commerce, and the Better Business Bureau.